If you can see potential energy savings opportunities and detect possible CO issues before they arise wouldn't you? Our restaurant monitoring package gives you the ability to see in real-time all of your facilities data 24/7 from any computer world-wide. You can then track energy usage and be alerted anytime CO levels rise above set levels. Now you can know if your employees are wasting energy day or night and even show them when and where through your online data analytics reports. Call today for a free demo of our useful monitoring solutions (877) 218-6232. Once you see the ease of use and power of our system it will change the way you manage your restaurants energy usage. All of our CO monitors include Temperature and Relative Humidity sensors to help you find areas to save money while ensuring restaurant carbon monoxide levels don't become an issue. Often the energy savings covers the cost of restaurant CO monitoring in a short period of time! We also offer refridgerator and freezer monitoring solutions to help you save money and cut down on food waste! Understand the importance of real-time CO monitoring. Aretas was hired to install wireless temperature, relative humidity and carbon monoxide monitors in the front dining room and back kitchen areas of their restaurant because of a possible gas leak that the local Fire Department could not find when called to the scene just weeks prior. Gathering information from the monitors 24/7 and setting custom alert levels in their online dashboard the Aretas staff informed the owner to reports of a trend in the CO readings. The issued turned out to be a deep fryer ventilation problem whereas the fryers heated up the ventilation unit did not come on causing high carbon monoxide levels above 100 ppm. Off-set cost with energy savings! There are many times when employees take it upon themselves to adjust the temperature of the restaurant or when managers forget to shut off the A/C or heat when the restaurant closes for the night. Our real time online monitoring systems can look back by hour, day, week or by setting a custom range to show your employees and managers how and when energy was being wasted. This information is a powerful tool for you to make the changes needed to introduce important cost savings. Whether you have one location or multiple facilities worldwide, our monitoring solutions are easily added to multiple locations that you can monitor anywhere and anytime from one central online dashboard. Now you know that potential carbon monoxide issues are being monitored and you are saving on energy costs while you sleep. 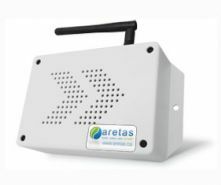 If your not a tech savvy person, no problem the system is easy to use after a live demo with your Aretas representative. Call or live chat today to get your questions answered!